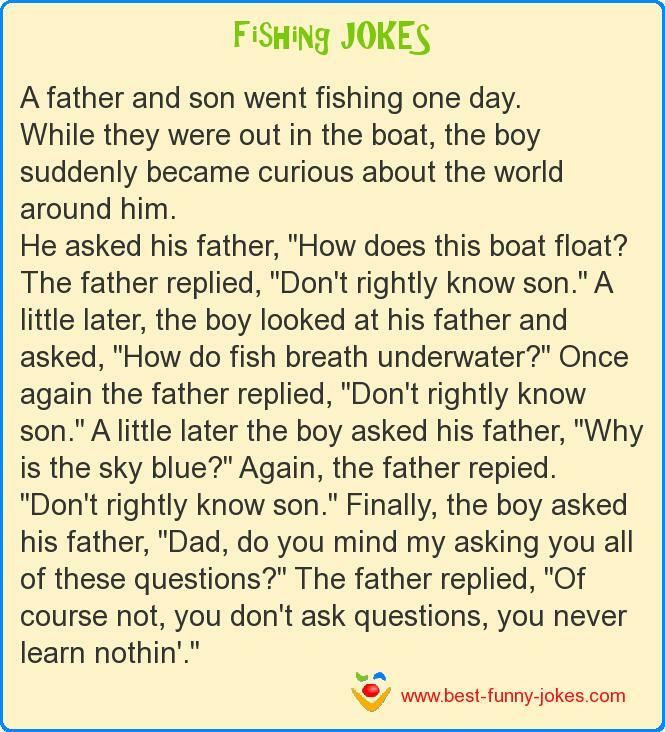 A father and son went fishing one day. While they were out in the boat, the boy suddenly became curious about the world around him. He asked his father, "How does this boat float? The father replied, "Don't rightly know son." A little later, the boy looked at his father and asked, "How do fish breath underwater?" Once again the father replied, "Don't rightly know son." A little later the boy asked his father, "Why is the sky blue?" Again, the father repied. "Don't rightly know son." Finally, the boy asked his father, "Dad, do you mind my asking you all of these questions?" The father replied, "Of course not, you don't ask questions, you never learn nothin'."